A school at the centre of a row over plans to close its sixth form has been issued with a notice to improve its financial position. 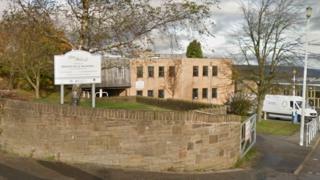 The Education & Skills Funding Agency (ESFA) has written to Bradfield School, Sheffield, saying its finances are "poor and worsening". The letter comes after staff and pupils staged a strike over the proposed closure of the sixth form. The school said it hoped to balance the budget "in the very near future". The letter says the school is in breach of its funding agreement and the Academies Financial Handbook after failing to submit audited financial statements for 2017/18. It states the school has also failed to provide assurances that it can achieve a balanced budget, saying it "continues to operate in both in-year and cumulative deficit positions". It says: "This letter serves as a written notice to improve financial management, control and governance at the trust. "It reflects the weak financial position of the trust and continued concerns on governance and oversight of financial management by the board." The letter goes on to say that the ESFA will monitor the school's progress, but that if it fails to improve its position the ESFA will explore intervention options. Chair of governors, Tony Moody said: "Governors at Bradfield School are working very closely with the Education and Skills Funding Agency to ensure that the budget becomes balanced in the very near future and we have financial stability moving forward. "The formal Financial Notice to Improve supports our on-going work to ensure that rigorous financial controls and procedures are in place so that we can return to a balanced budget from September 2019." In January, while consulting on plans to shut the sixth form, the school said it was "deeply in financial deficit", adding that it ended the "17/18 academic year with an in-year deficit of £400k". It said it expected that by the end of the 2018/19 academic year that deficit would have doubled to £800,000.